Click on the story map below to see a visual of how we conduct our research, and view our field sites summer 2015! Click on the map to see how we designed our experiment. Species Distribution Models (SDMs) can be useful tools to predict current and future suitable habitat of species. These models are based off of known population occurrences and environmental variables, typically high resolution climate data recorded by satellites each week (ex. PRISM). The climate data is used to extract a “bioclimatic envelope,” or a range of climate variables that the species is known to occur within. This envelope can be forecasted into the future using climate projections produced by Global Circulation Models (GCMs). Remember, all models are wrong, but some are useful! Figure 1: Preliminary Species Distribution Model (SDM) of S. austromontana (inset photo) displaying the present suitable habitat (red) and the predicted suitable habitat for 2080 (blue), under an ensemble of 23 global circulation model predictions for the A2 scenario. Initial results indicate a 73% reduction in suitable habitat by 2080. Bioclimatic envelope derived using 24 climate variables downscaled to a 1km resolution using ClimateWNA. Map by Trevor Bloom. Figure 2: Using the polygons from the SDM, my colleagues Donal O’leary and Katherine Rosa extracted the elevation and latitude values from the DEM (Digital Elevation Map) file provided. They used this information to graph the relationship between elevation and latitude for the present and future suitable habitat of S. austromontana predicted by my model. The present center of density of suitable habitat is at lat=51.875 Elev=1336m. The future center of density of suitable habitat is a lat=54.6875 Elev=1617m. Click on the graph, to see the R-code and methods used by Donal O’leary and Katherine Rosa. 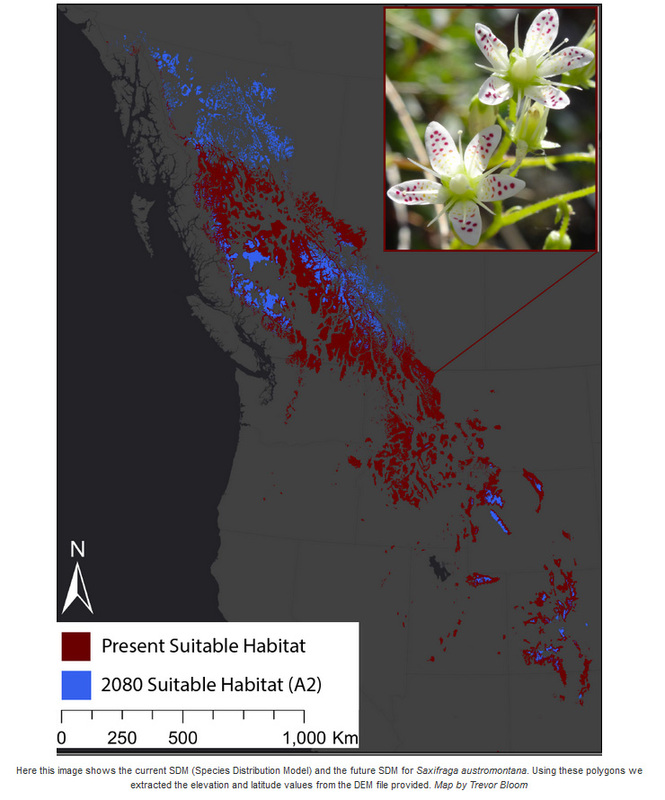 Modelling the impacts of wildfire on the high elevation species, Saxifraga austromontana. The distribution of S. austromontana. 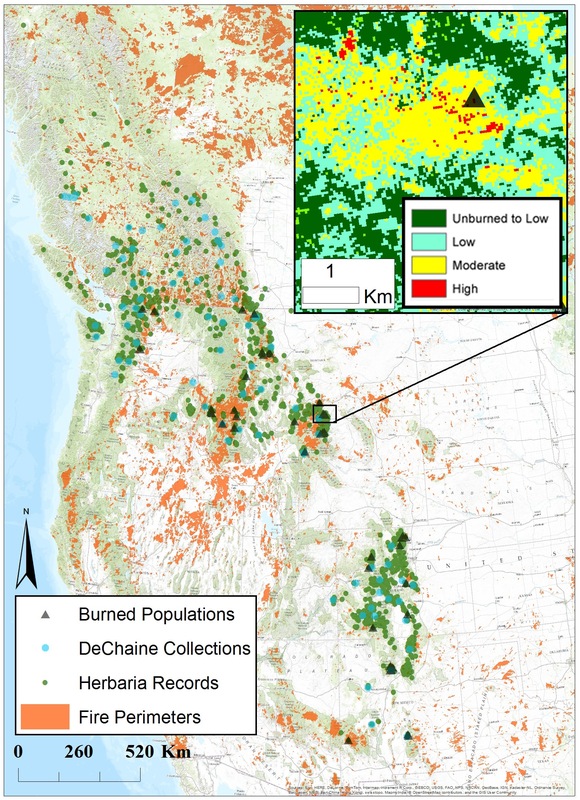 Fire perimeter data from MTBS was used to locate populations that have burned over in the past 3 decades (1984-2014). In my field study burned sites (black triangles) will be paired with unburned sites (green dots) to assess the impact of wildfire on the species. The inset map displays the fine resolution MTBS internal heterogeneity data used to extract the severity of the burn. Existing collections by the DeChaine lab are also shown (blue dots). Map by Trevor Bloom.